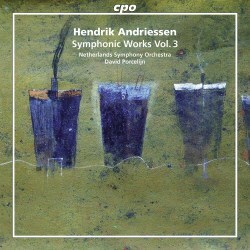 This, the third volume in CPO's survey of Hendrik Andriessen's symphonic music, is, as was the case with its predecessors centred on a symphony (review of Volumes 1 & 2). Here it is the Third Symphony keeping company with some other orchestral works from his substantial output. The Symphony No.3 was completed in 1946 and reflects on the war years. Though it may not be as ground-breaking as, say, Vaughan Williams' Sixth, it has its moments of rough energy, revolt and eventual reconciliation. The war years were not easy for Andriessen for he refused to cooperate with the German occupation forces. With many 'leading compatriots' (as Leo Samama calls them) he was imprisoned in Camp Sint Michielsgestel for almost six months. He was then able to resume his duties in Amsterdam and Utrecht as well as to continue composing which he did until the end of his life. The Third Symphony is thus the major outcome of that period. Like its predecessor, the Third is roughly cast as a suite opening with an atmospheric Overture which Samama describes as 'in fairy tale mood' although there are some rough edges as well. This leads into a more developed Sonata that is not without its bright moments. This is followed by a beautiful Sarabande not unlike the Pavane movement in the Second Symphony sometimes briefly thematically linked to the first movement. The symphony ends with a powerful Fuga in which Andriessen fully demonstrates his mastery in handling complex formal designs while eschewing the academic and the pedantic. Andriessen's Third Symphony is probably one of his best known works; quite deservedly so for its formal mastery, its superb scoring and its overriding optimism for all the darkness of its historical background. Its first performance in 1946 must have had the same impact on Dutch audiences as the first performance of Vaughan Williams' Fifth during the war years in London. The Symphonie Concertante was written for the 150th anniversary of the Noord-Hollands Philharmonisch Orkest, in those days the orchestra of the city of Haarlem and the whole province of Noord-Holland. It is somewhat of a hybrid. First of all because its title implies a concerto for orchestra which it is not, although there is some brilliant instrumental writing in the music; second because – as far as I am concerned – its three movements do not 'fit' together. The outer movements are cast as symphonic Allegros preceded by a slow introduction and contain forceful, energetic music. The central movement, cast as a theme and variations on a 16th century tune, has the character of a suite in old style that might even have had an independent life of its own. I hasten to say that this theme and variations — in itself a sort of dance suite — is beautifully crafted and wonderfully scored. That said, I cannot help but feel some stylistic hiatus between this movement and the outer ones. The Overture “Chantecler”, the most recent work here, was inspired by the eponymous play by the French playwright Edmond Rostand, probably better known for Cyrano de Bergerac and L'Aiglon. The composer insisted that the overture is by no mean programmatic. Chantecler is a rooster, whose single purpose in life is to sing at dawn and wake up people in the morning; not for him the vanities of modern life. “Que m'importe! Je chante!” (what do I care, I sing!). The music of this short, colourful work traces the whole day from dawn to evening with passing suggestions as to what goes on around the farm. This may not be Andriessen at his very best but this is certainly a nice little piece well worth the occasional hearing. Performances are just superb: David Porcelijn conducts a marvellous reading of the Third Symphony and is wholeheartedly partnered by the Netherlands Symphony Orchestra. Excellent recording and well informed notes by Leo Samama, an expert on Dutch music if ever there was one. Now I look forward to hearing the fourth volume and one need not be a Madame Sosostris to say that it will include the Fourth Symphony. Maybe, too, CPO will later release a disc of Andriessen's concertos.